Welcome to NRI Relocation, rated one of the best corporate relocation companies to partner with for moving talent around the world. We Propel Key Talent to New Career Opportunities Worldwide so that Employee Engagement, Productivity, and Success can Thrive. We do this by connecting our values-based philosophy of Taking Relocation Personally with every client and each employee. We’re proud to announce our recognition as one of the Top Relocation Companies to partner with by HRO Today Magazine! 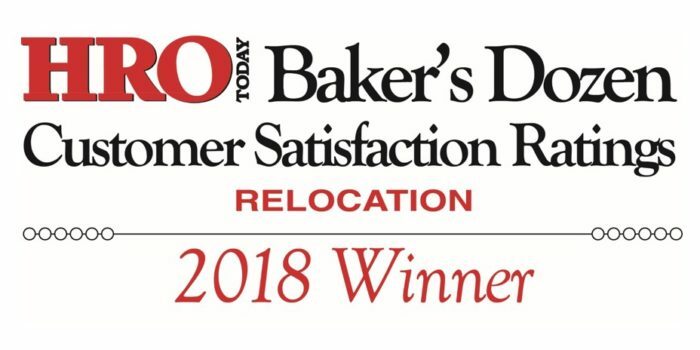 The 2018 Baker’s Dozen Relocation Ratings ranked over 40 relocation companies for customer satisfaction directly from client buyer feedback. To learn more about how we’re one of the best corporate relocation companies to partner with, please Contact Us for a free overview and consultation. Or visit our Relocation Services and Relocation Technology sections to learn more.